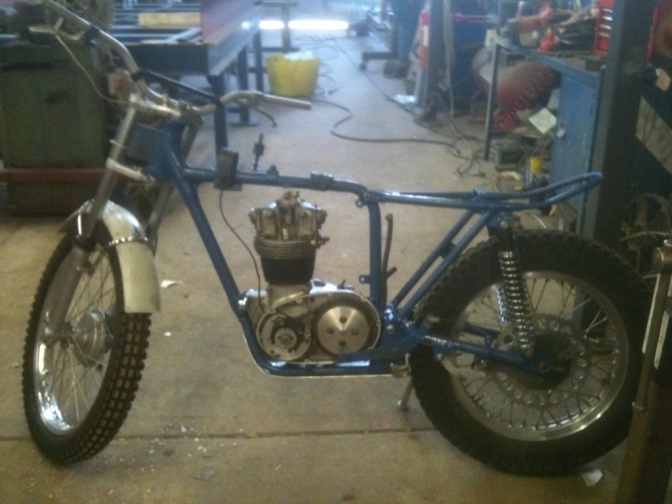 Trials test,and Build Discription, along with later modifications and rebuild of engine and frame. Of the Ex Bryn Hyatt BSA C15T. This is the guy that built the bike, Bryan Hyatt from Gloucestershire. 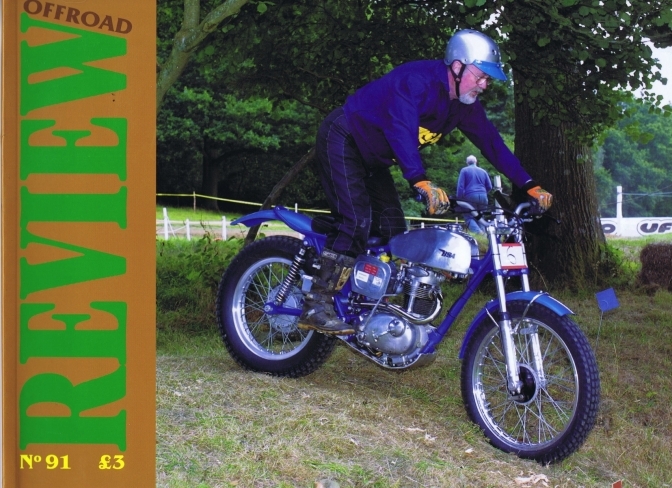 I first spotted this gem of a little bike plastered across the front cover of one of the brilliant Offroad Review magazines, number 91 to be precise. That is a pretty little bike I thought at the time, I would not mind that, well to cut a long story short we now have it in our collection. And it is still one of my favourites. So let me explain what makes this little bike special. The frame started life has a genuine C15t of about 1960 it has the frame number to prove it. But then Bryan set to work with a hacksaw and welder and brought it into the 21 century. The steering head angle has been steepened a tad. The frame bottom rails have been removed and then replaced with a tight fitting alloy structural sump plate. 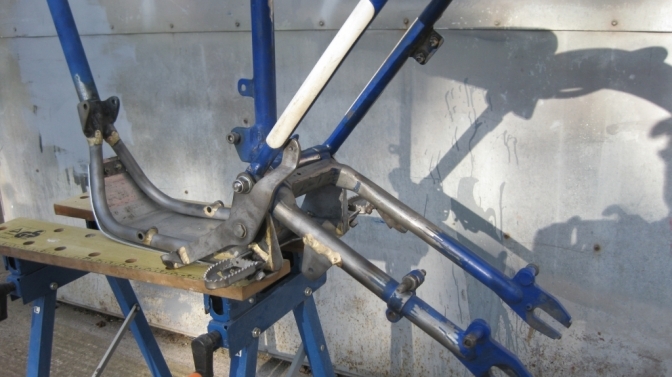 And the main modification has been to the swinging arm. This has been lengthened and made wider, but cosmetically looks about the same has the original. OK the front end, Well the forks are Metal Profile of the period, with softish progressive springs fitted .Front hub is from a BSA Bantam Super, with some internal modifications, and is a good little stopper. Back hub is from a Bantam again fitted with an Acront alloy rim, has is the front, but has not been widened as is the trend. A 62 tooth 428 alloy sprocket completes the drive train. The engine fitted is a 1962-3 F type that was fitted with the points on the side, but now that it has PVL contactless ignition fitted into the primary case, this was unnecessary and has been machined off, and replaced with a welded alloy plate then cosmetically finished. Internally the engine is pretty standard, as are the wide ratio gears, But it has a bit bigger piston fitted, in to a much modified BSA B25 alloy barrel, and a "S" type cylinder head with bigger valves, breathing through a long inlet tract connected to a Japanese Keihin carburettor, as fitted to an XL 125 Honda. Clutch is standard apart from the alloy pressure plate and the smallest gearbox sprocket is fitted. 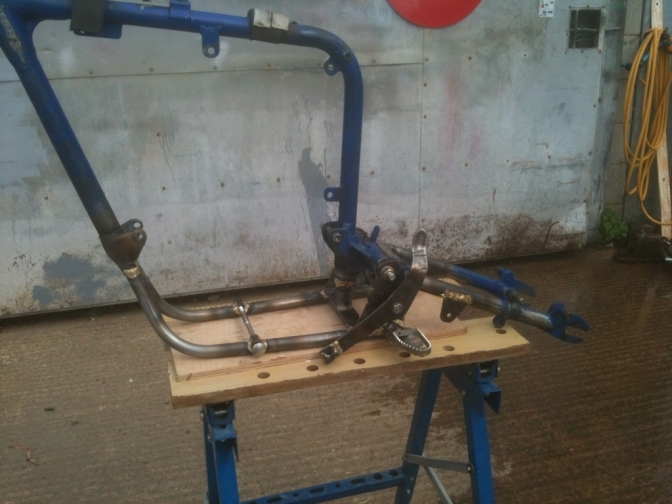 A neatly built rorty little alloy silencer completes a standard front pipe exhaust system. Other features are the unfortunately now dented super slim little alloy fuel tank ,a Terry Weedy alloy oil tank and air cleaner box, and the distinctive Azure blue paint job and plastic guards. Back shocks fitted are by Falcon. So how does the little Gem ride? Well starting is no problem, choke on from cold then one or two prods and she springs into life. You might be slightly worried about the exhausts note in a built up area, because she is loud. First gear hooked in with your heal sets her off slowly, and I do mean slowly, as bottom gear is as low as they come, and with the power the little buet supplies would send you up the side of a house no problem. Second and third are well usable in sections, and even top is possible. But take a magazine to read on the road between sections, cos you will have time to read it. She is not fast on this gearing. Power is smooth all the way up, but that's the Jap carb and the ignition set up correctly. Steering is just about right for the tightest Nagery and does not seem to cut in. What else can you say! But "it does what it says on the tin". This was the bike that Patrik Svensson rode at the Classic trials show, and enjoyed himself immensely, riding in every solo class, even though he did find his own route, on a lot of the sections, the little bike just kept on going! Bryan turned up at the show too, and was amazed to see his creation again, and was so pleased. The boys in the Isle-of-Man have had the little bike for two years to play with. It was when Stuart rode it in the Manx Classic Trial last year, that a problem with the alloy barrel fitted by the previous owner showed up? 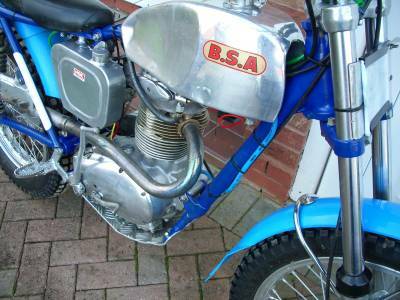 Well the barrel was a shaved down BSA B25 unit with spacer fitted underneath? fine but with a C15 cylinder head fitted there is no actual seal for the top of the push-rod seal, only the head gasket. has can be seen in the photo above. For club trials a drop of oil leaking can be tolerated, but with the road work in between groups of sections ,and the engine getting more than warm, a "Torry Canyon" situation soon occurred. I later discovered that there was no rocker oil drian in the barrel either, the drain holes are opposite on a B25 barrel to that of a C15, so you need to fit an alloy drain tube in the barrel to match with this. Page on this modification Later. The cure? well the push-rod tunnel that is part of the barrel casting on a B25 can be cut away and a C15 push-rod tube fitted. But now I have the bike back,over, I have decided to put it back to its original Bryan Hyatt spec. 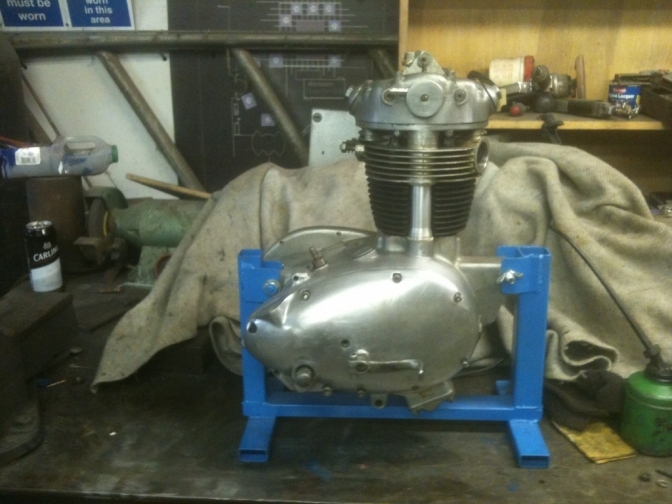 So a lightened C15 barrel will be fitted along with a Triumph piston, and reconditioned cylinder head. The Japanese carb will be replaced with a New Amalminium concentric carb. The front wheel needs rebuilding with a new Cub hub and back plate. fork oil seals will be replaced and the bike made Smart again. Coincidence was that yesterday Deryk Wilde placed a picture of Bryan on his BSA Bantam onto Trials Central.and with my comment later put the front cover picture from volume 91 of Off Road Review,on as well for me. Thank's Deryk he also took the snap. I Still think it is a pretty little bike. 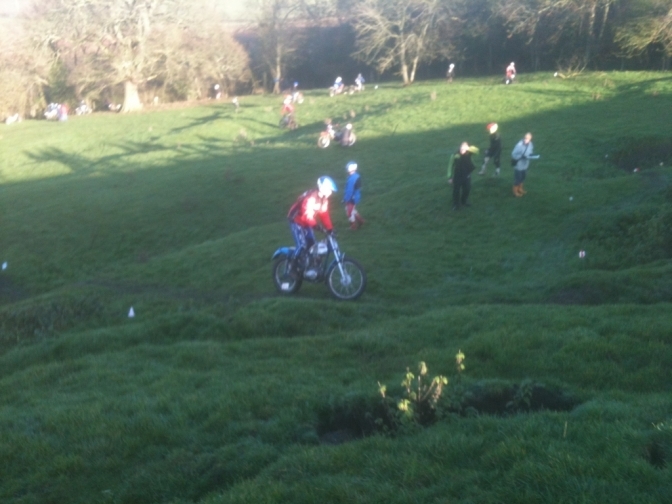 This is Stuart in the sunshine on Boxing Day 2013 at Ufton Warwickshire. Enjoying his ride on the C15T. And the C15T had its engine removed for rebuild and updating. 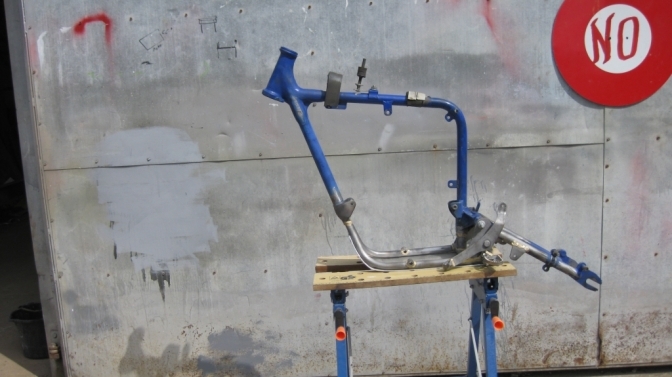 The following Pictures are what we have done to the bike so far. The engine is now rebuilt and sporting a rise in CC's and higher compression ratio. I've been following your escapades on here for a few years now and gotta say I just love the builds your doing and the philosophy behind them. Just read up the latest installment on C15 trials test, with the video clip at the end.....Sea sick Steve.....man his music is just SOOOoooo pure. Keep doing what your doing. Thanks Trev, we do like the comments on this site good and bad. 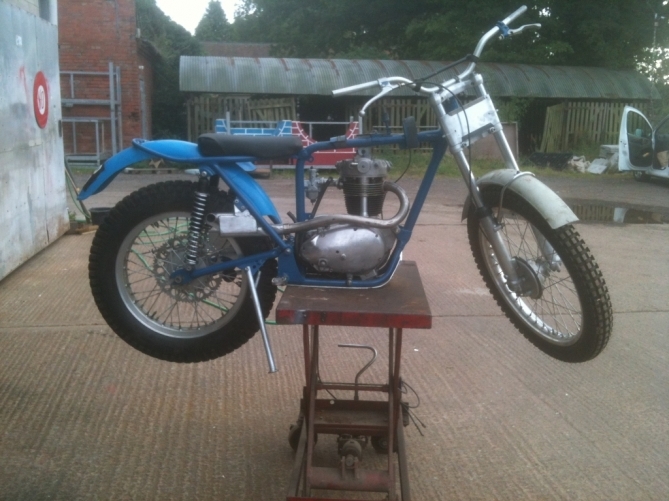 I think I am the Classic Trials Bike Sea Sick S , just ask the folks when I am traveling to the IOM. Update this week!! only I have been Sick OK.
Frame modifications now complete and ready for sand blasting and painting. The swinging arm is now running on fibre reinforced plastic bushes. I just had to include this shot? 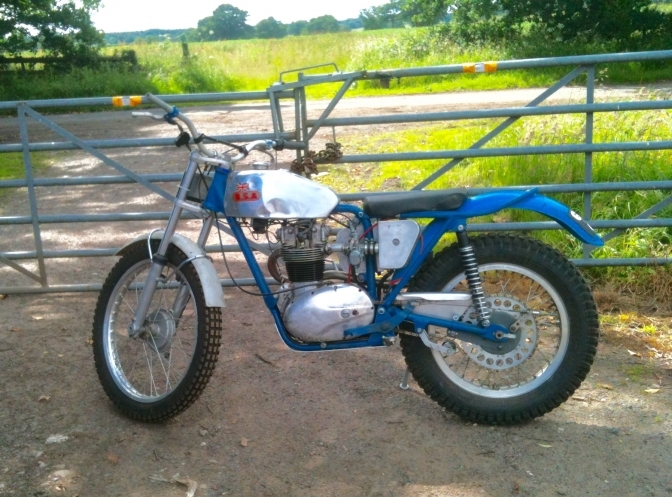 What better on a sunny Sunday afternoon than to be playing with your beloved Classic trials Bikes!!! Despite the sign , that was put there to state that you should really be working on other things. OK, you can see that I enjoyed my afternoon. 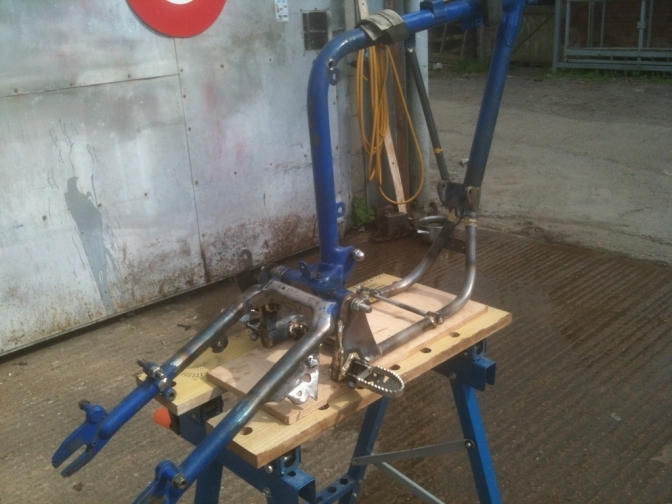 I made up the 1/2" swinging arm pivot spindle, and fitted the sub-frame and swinging arm. 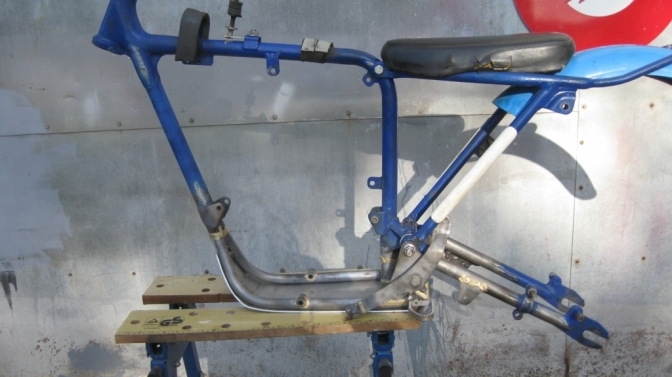 The frame modifications are now sand blasted , and tomorrow I will be coating the frame with Hammerite Smooth Blue? Well I will give it a go and see what it turns out like. I am really pleased at the way this conversion has gone despite it's interruptions. Sprayed the frame with Hamerite Smooth Blue. ? to try it . I have used the more expensive products as you know , but before spending over £100 on having the frame powder-coated. I thought I would give this a go, and it was on Red Pencil at Wickes when I went to buy it. So I sprayed it with the Appolo without any thinners? Fine but it is a bit Orange peel'y Not to worry I just needed to get plenty on. You can judge when it is rebuilt. Which I started today. I must say after cleaning and repainting the Falcon rear units, You should probably not buy any other make. They work fine still and have suffered the salt air of the IOM for two years , has well as being in the Cotswold's for probably ten years. I could do with some more stickers for them though Robin!!. 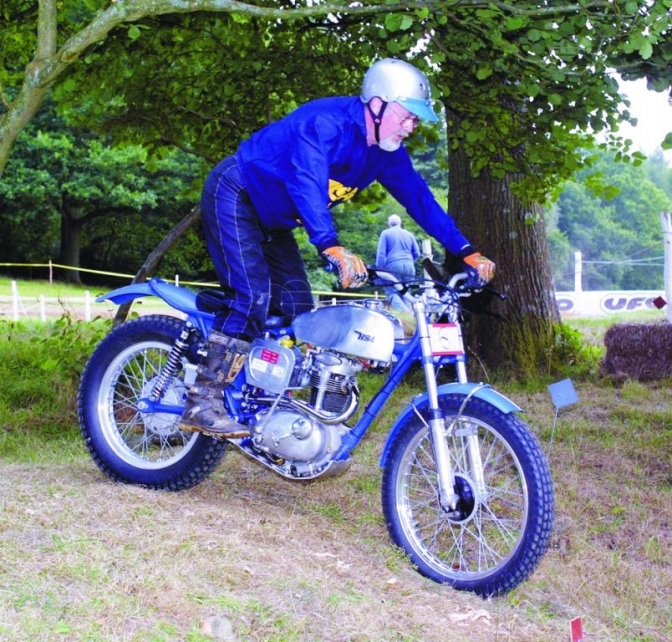 And there is a photo of Patrik Svennson on his Special BSA in the 2012 Scottish Two day trial. 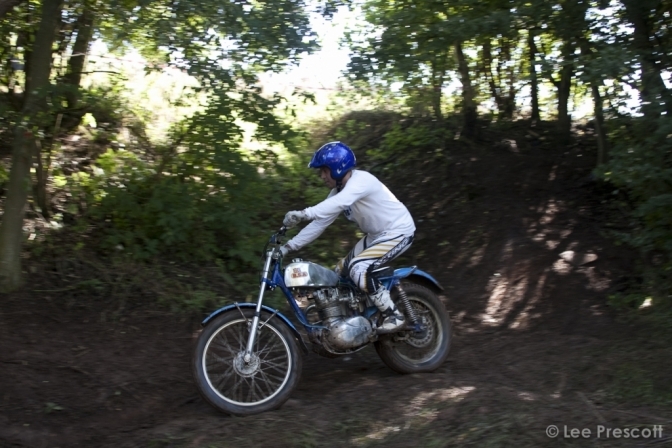 I sent Deryk a picture of Patrik ridding this bike in the Classic Trials Show 2010. Patrik is a bit of a wild child ? if you look at his drifting a Volvo 242 on You-tube. 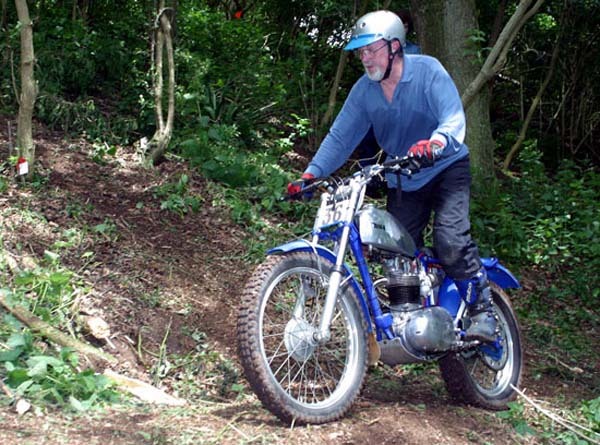 He did love this trial and rode in every class, although he did tend to take his own line on most of the sections, But this is what trials riding is about! Enjoying yourself surely! This is the rebuilt engine, now with a few more CC"s,now 280 , better bearings,Alpha conversion and a few other modifications. along with re fitting a steel barrel. same weight as an alloy one when bored out for bigger piston (Triumph). This may not look it, but the engine has been a tight fit., Just again proves to me how good the "Otter" frame is. Here is the latest progress that was completed last month. Note seat has been re-covered now. This is the bike now finished again,with just the need to start and check it over Note I fitted a New Mikuni carb instead of an Amal.